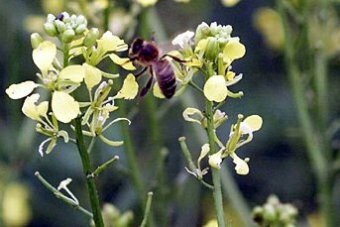 The Northern Territory Department of Primary Industry (DPI) is warning Top End growers to be careful of bee populations when spraying crops. Last year there was a sudden loss of bees in the Top End, and while no one’s figured out exactly what caused it, the DPI has an inkling it may have been caused by people misusing certain pesticides. “We have basically no disease or pest that affects our bees… [but] it’s the spraying of pesticides, herbicides and weedicide, that can affect the health of our bees up here.” said DPI apiary officer Vicki Simlesa. She says people using sprays, need to check they are using them correctly, in accordance with the label and the DPI. The warning is extended to gardeners and roadside sprayers who spray chemicals in the path of pollinating bee populations. “We had a loss of bees occur during last year. “We’re not sure if that is related to pesticide poisoning, or some other disease or pest. Ms Simlesa says a loss of bees would have a direct impact on the Territory’s growing melon industry, which the DPI recently estimated is worth $80-90 million per year. This entry was posted in Fauna Impacts on October 23, 2016 by Anthony.